Over the past week, Steve and I were in Israel with our global leadership team from Reach Beyond. We had an amazing vision summit, but we also had the chance to visit several significant sights while there. The trip was amazing! I thought I’d share with you three reflections on what was most significant for me personally. Hopefully, these thoughts will encourage you! 1. The Profound Suffering of Christ. In our culture, we prioritize pain management. We take Advil or Tylenol for a headache. We go for a massage when our back hurts. We minimize pain in any way—and that’s understandable. I mean who enjoys pain, right? As a result, I think we often minimize the pain that Christ suffered. Visiting Caiaphas’ house and seeing the dungeon where Jesus was whipped, pummeled, and beaten brought me to tears. He willingly suffered more pain than you or I will ever experience because He loved us. For Jesus, love meant sacrifice. 2. The Importance of Unity Among His Followers. Visiting the Garden of Gethsemane reminded me of the prayer Jesus prayed, “Let them be one even as we are one” (John 17:11). It’s so easy for a spirit of judgmentalism to rise up in us. We find fault with one another and criticize each other. 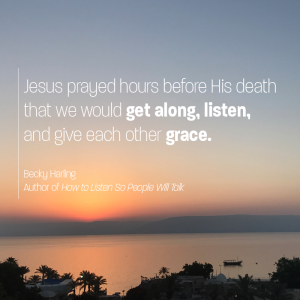 As I looked into the Garden, it struck me in a new way: Jesus prayed hours before His death that we would get along, listen, and give each other grace. Profound, huh? 3. The Urgency of His Message. As we visited the upper room, my mind reflected back on the task Jesus assigned His followers, “Go and make disciples of all nations” (Matthew 28:19). Many biblical scholars believe that the upper room was where the disciples were after the resurrection. It was, in many ways, the birthplace of the early church. Here’s the thing: the message hasn’t changed. It is urgent for today. There are many people who have still never heard that Jesus loved them so much that He gave His life for them, and that He didn’t stay dead, He’s alive today! That is very good news! If you are a follower of Jesus, your task is the same as the one He gave the disciples: Tell everyone – Jesus loves them! Here’s a question for you to consider: Read John 17 and leave a comment about what is most profound to you about Jesus’ prayer. That JESUS Christ love us, cause he is asking the father to sanctify us has he as sanctified him.